She was a beautiful doe. Vegetable Venison Lasagna is a lean dish full of flavor. My husband, Kurt, got his first deer this year: a 125-pound Middle Georgia doe, which yielded about 40 pounds of meat. What a way to pack the freezer! Hunting is not only a fun sport, but an economical way to enjoy God’s green Earth. Kurt has been hunting for two years, and his moment finally came on a cold November morning, the weekend after Thanksgiving. We had the deer processor to divide the meat into sausage, ground deer and cubed meat, and I’ve had fun coming up with creative ways to feature wild game. If you’re familiar with deer hunting, then you know how it all works. If not, when you take your kill to the processor, most deer processors will ask you how you’d like the sausage seasoned and if you’d like additional fat added to the ground meat. We requested mild seasoning for the sausage, and no extra fat, because it gives me more control in the kitchen, and depending on the type of dish being prepared, allows me to build flavors accordingly. Take for instance my Vegetable Venison Lasagna. Lean and packed with tender, sautéed rounds of squash and zucchini, the dish is seasoned with Italian herbs and crushed red pepper flakes for extra zip. I made it on a weeknight and took a shortcut by using oven ready lasagna noodles and a good quality jar of tomato sauce. Topped and layered throughout with fresh, salty Parmesan cheese, the casserole takes about 25 minutes in the oven to bake. Venison tastes very similar to ground beef. It’s not gamey as some might presume, and seasoned correctly, it complements pasta, grits and a variety of other dishes. 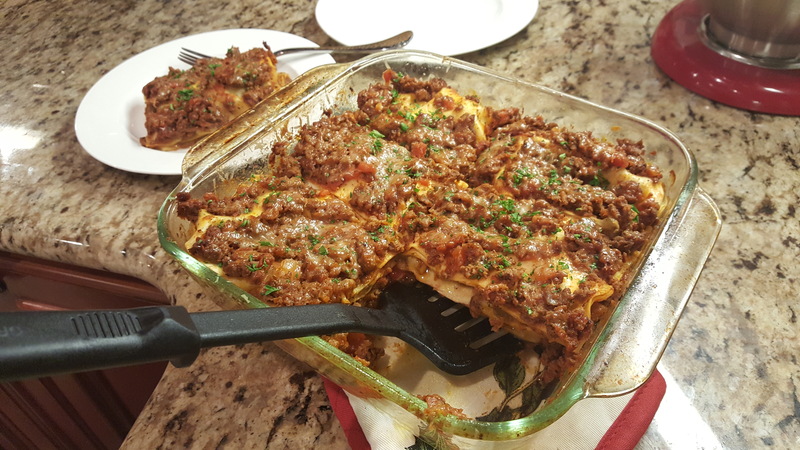 This vegetable venison lasagna is my favorite way I’ve eaten deer meat so far! Layers of pasta, meat sauce and cheese…what’s not to love? To round out the meal, serve this dish with bread and a garden salad. How do you prepare venison? Share your recipes with me on social media with #SomeKindaGood. Good food and good company, that’s what it’s all about! Be sure to saute your squash and zucchini in a single layer, so that the vegetables get golden brown. If you overcrowd your pan, they will steam instead for a soggy result. Pre-heat the oven to 375 degrees. In a medium saucepan, using a wooden spoon, cook venison and garlic until browned. Season the meat well with salt and pepper. Because venison is such a lean meat, there is no need to drain the fat as there will be very little. Add jarred tomato sauce and simmer on medium low heat for about five minutes, adding in the dried herbs and crushed red pepper flakes. Taste the sauce and season it again with salt and pepper. Meanwhile, in a separate sauce pan, heat 1 tablespoon of olive oil over medium-high heat. Add squash and zucchini in batches, being careful to place them in a single layer to brown. Do NOT pile the squash and zucchini high or else they will steam and become mushy. Flip the vegetables once during cooking, about 2 minutes on each side. Season with salt and pepper. When the vegetables are finished cooking, begin layering the lasagna. 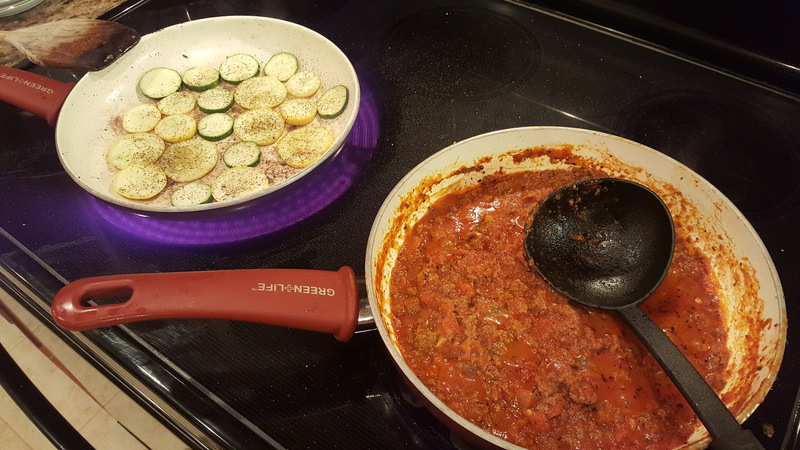 Using an 8 x 8 glass casserole dish, begin with the meat sauce first, followed by a single layer of zucchini and squash, then Parmesan, then two to three sheets of pasta. Repeat the layers until ingredients are all gone, finishing the dish with meat sauce, topped with the remaining Parmesan cheese. Cover the dish with aluminum foil and bake for 25 minutes. Then, remove the foil and finish baking the lasagna for five minutes to brown the cheese. Let stand about 10 minutes before cutting. Slice casserole into six hearty portions. Garnish with fresh parsley. Georgia native Rebekah Faulk Lingenfelser is a freelance writer, entertainer and food enthusiast who writes and speaks about her love of good food and the Coastal South. A Season 2 Contestant on ABC’s “The Taste,” she is the Statesboro Herald food columnist and host of the television program “Statesboro Cooks.” She appears regularly as Celebrity Chef at the Statesboro Main Street Farmers’ Market and has written as a guest blogger for Visit Savannah, Savannah Taste Experience and The Local Palate. A graduate of Georgia Southern University, Rebekah is currently seeking her associate’s degree in culinary arts at Savannah Technical College’s Culinary Institute of Savannah. To learn more, connect with Some Kinda Good on social media, or visit RebekahFaulk.wix.com/RebekahFaulk.